Steven Combs - I’ve found my iPad Markdown Editor! Filed under apple on January 15, 2013. I’ve found my iPad Markdown Editor! 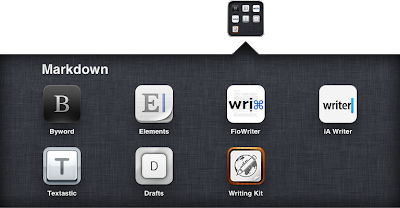 For quite some time now, I’ve been trying to establish an iPad mini academic writing and blogging workflow. I have a workflow on the Mac that works well; however, I need to duplicate that one as closely as possible on the iPad mini. Doing so will provide anywhere access to my content and writing tools. The main components of my workflow must include cloud storage and a good text editor that supports Markdown. My cloud storage of choice for text files is Dropbox. Okay, that was easy since almost every app out there supports Dropbox. The hard part is locating a worthy text editor. There are many iOS apps in the App Store that claim to be the best text editor, and while some of them are probably great apps for the general public, very few of them embrace Markdown or more specifically, MultiMarkdown. If you are not familiar with Markdown, or its more powerful variant – MultiMarkdown, don’t worry; most of the population isn’t. After the break below I’ll provide a Markdown primer and reveal my iPad text editor of choice. If you are already familiar with Markdown, I suggest you skip the next two sections. However, if this is a new concept, read on. Markdown is a tool that geeks and tech writers embrace to easily format text without the need for your hands to move off the keyboard. You use special characters to bold, italicize, hyperlink, create tables, etc. The special characters are readily available on your keyboard. This allows touch typists to keep their hands on the keyboard. The format is extremely portable and you can generate Markdown documents in any text editor or word-processor. There is no need to worry about proprietary formats as long as the application can save as a plain text file. Once the document is complete, and depending on the editor or post-processor you use, you can export your Markdown document, complete with formatting, to .rft, .pdf, .doc, or even .html file formats. This blog post was created first in Markdown and then later exported as HTML for Blogger. Once you understand Markdown and embrace it, it really is a powerful tool that can significantly speed document creation. Let me share a couple of examples to clarify. This is a line of *text* written in **Markdown**. This is a line of text written in Markdown. The beauty of the ordered list code is that you never have to worry about the particular number or how your word-processor formats ordered lists. Markdown will figure this out for you when you export and preview. Those are two very rudimentary examples to give you an example of the types of tools I need in an iOS text editor. In the first example, I would like a tool that will automatically complete the pairing of the asterisks. I type the first set and the text editor includes the second automatically. In the second example, the editor should automatically generate the 1. text after I create the initial line and hit return. Markdown has many more powerful features and even more power in MultiMarkdown. Visit Fletcher Penny’s MultiMarkdown page to learn more. Of course my Markdown examples are simplistic, but they do provide a sense of why a text editor that supports Markdown is important to my workflow. For instance, many Markdown editors make the generation of Markdown code easier by auto-completing those asterisks or providing quick access to code characters on the iOS keyboard. But enough about Markdown, you can read thousands of blog posts on this topic. Let’s get back to locating an editor. A Google or App Store search for a Markdown capable text editor results in an overwhelming number of options. I needed some guidance, so I turned to the the wonderful iTextEditors chart by Brett Terpstra. Brett’s guide compares the features of every text editor found in the iOS App Store and even provides screen shots. It is an amazing resource and if you are looking for any kind of text editor, Markdown capable or not, I highly recommend you take a look at this resource. And yes, it cost me a bit of money to narrow my selection down since trial versions of iOS productivity apps are rarely available. Hopefully this post will save someone a few bucks. QUICK NOTE. While many of the apps below have an iPhone and iPad version, my reviews are all based on the iPad versions as I find lengthy writing on the iPhone to be extremely painful, hazardous, and fraught with errors. I also chose to review each app without an external keyboard. If I want a physical keyboard for writing, I turn to my 11” MacBook Air. Let’s take a quick look at the text editors I tried and share some brief comments about each before I reveal a winner. The apps are presented in alphabetical order and I used the associated editor to write each section. Images are included and you can click on them to view larger versions. Byword – I like this editor and for some time it was my favorite. It includes a Markdown keyboard and good export options. Byword also integrates well with its Mac OS X sibling. I still often go back and visit Byword for iOS regularly and would recommend it if you want a solid, non-crashing app that focuses on writing rather than overwhelming you with options. While a very good editor, its lack of advanced features keeps me from making it my primary editor. Drafts – It is probably unfair to include this app in the roundup. Drafts is less of an editor and more of a thought collector. Use it to quickly capture a thought and send it to another application. I use the app regularly for this purpose and love that a Markdown keyboard is included. What knocks it off as my primary editor is its lack of Dropbox support. You can send and/or append text to a Dropbox document, but you cannot edit that document later in Drafts. Again, this is probably not a fair comparison. However, if you work in Markdown, you will find Drafts an excellent supplement to whichever app you choose to make your primary editor. Elements – This was my primary app for consolidating and archiving text files in Dropbox before I discovered Markdown. It is a fine tool, but preview and export is the extent of its Markdown support. Elements is in serious need of an update that includes a Markdown enhanced keyboard and some bug fixes (it often crashes when I try to rename a file). FioWriter – The appeal of this app is the enhanced keyboard that includes Option, Control and Command keys. Using this keyboard makes the iOS experience more like that of a full fledged Mac. If you dig into the documentation for the app, you will also find a way to reveal extra keyboard rows for common punctuation, useful for Markdown creation, and common symbols such as the Apple symbol and currency. The app fails my usage test because FioWriter does not include Markdown preview or export. To bad though, I really like the enhanced keyboards. iAWriter – This is a very promising app, but lacks a few critical features. While it includes an expanded keyboard, with excellent cursor control, it lacks a special symbols keyboard. The lack of text size and background color preferences (which the programmers list as a feature) was also a disappointment. A unique feature though, is the writing focus mode that ghosts out all but the current three lines, taking distraction free writing to another level. Textastic – I have a huge love/hate relationship with this app. My initial excitement came from descriptions that this app was the iOS version of my preferred Mac text editor, TextMate. In fact, Textastic is almost a better clone. It has an extremely useful enhanced keyboard and includes a navigation wheel that is absolutely better than any navigation/selection tool on ANY iOS app. It even supports some TextMate plugins. Thrown in for good measure is code completion, outlining, FTP support and tools for preview and exporting. So why isn’t this the winner? Because it does not support a synchronous Dropbox. Sure you can download and upload to Dropbox, however this is a manual process. You must remember where the most recent version of your document is located. This simply won’t work with my workflow and adds a layer of complexity that makes me reject what I really want to be my go to editor. I, and others, have harped on this issue in the App Store and here’s hoping we see synchronous Dropbox support in a future version. **Writing Kit** – The last editor in this list is not just the last in our alphabetical list, but is the clear winner in my roundup of apps. So rather than write a short synopsis here, I’ll just dive right into my comprehensive review in the next section. After an exhaustive and costly search, Writing Kit is my clear winner. Writing Kit is not an editor you find frequently discussed and I am not sure why. It includes the features of many other text editors, but then ups the ante by including some extremely useful research and writing tools. A testament to the app is the fact that roughly 80% of this blog post was composed primarily with this app. Let’s take a closer look at the key features of this app: Markdown and research tools and then follow up with the additional features that are simply the icing on the cake. First off, Writing Kit includes an excellent enhanced Markdown keyboard. The keyboard includes a formatting row that you can slide left and right to reveal additional options as shown in the image below. The programmers have also included a unique way to move the cursor. Want to move the cursor left one character? Simply tap on the left hand side of the screen. Mirroring this action on the right will move the cursor to the right. This is brilliant. Also included with the use of the enhanced keyboard is automatic list creation. Use the formatting bar to create a Markdown list and when you hit return after each line, you a presented with the * character on the next line with the cursor in position for the next item in the list. There’s also an option for a numbered list. To make movement throughout a lengthy document easy, Writing Kit also includes a navigation window. Items in the window are created based on the embedded links and headers. To move quickly to another area in the document, reveal the outline and click on the link or header. Lastly, while as I mentioned earlier that I despise writing on the iPhone, Writing Kit is a universal app. The iPhone allows me to capture quick thoughts, review works in progress, or make quick edits. Although a cramped experience, I do find it useful. Writing Kit earns its name by including several unique features that I have not found in any other writing application, whether it be a rich text editor or a simple text editor. The first feature is the integrated browser. You can activate the browser, search to your heart’s content, highlight content on a page and then quickly insert that content into a quoted area within your document. Sure you could perform a similar task by switching to Safari, copying the content, and switching back, but you won’t find it as seamless or productive. It really is a great tool and once you use it, you will wish more apps included this feature. Capitalizing on the built-in browser code is the Quick Research window. This window allows you to quickly perform a calculation or conversion, work with specific dates, display the weather for a particular location, search for facts and figures, display a map, locate a zip code, track a shipment or generate a random number. There are many other options too numerous to list. The results of each research question is revealed in either the Quick Research window or in the included web browser. Results are pulled from popular search engines. From there you insert the content into your document. It’s dead simple and extremely useful. This option alone makes Writing Kit worth the money. As if the Markdown and research features weren’t enough, Writing Kit continues to give with the addition of three more outstanding writing features; TextExpander, Terminology and Fountain support. TextExpander – is a tool to automate the writing of lengthy or redundant text. Let’s say you want to add your address in a letter. With TextExpander support, you can create a small snippet such as ,,addr and once entered, TextExpander will replace and expand the text to the entire home address thereby cutting down on significant typing. That’s just the tip of the iceberg for this tool. You will find many ways to use TextExpander and I only wish Apple would allow us to use this tool throughout iOS. For now it is limited to just those apps that support the TextExpander API. Thankfully, Writing Kit is one of those. Terminology – provides quick access to further research words, their meanings, and usage. Think of it as an electronic thesaurus. It is a separate iOS app that, like TextExpander, provides APIs that other software can hook into. In Writing Kit, you can select a word, select the Lookup... option, and Terminology will load with the word’s Terminology entry. You can examine synonyms and antonyms or other words and once the review is complete, a button is present to whisk you back to Writing Kit at the exact point you exited. If you purchase Writing Kit, pay the few bucks extra and add Terminology 3 as well. It will enhance Writing Kit and provide you with an extremely useful writing tool. Fountain – Markdown for script writers, not programming script writers, the Hollywood variety. Script writing software can be expensive and the open source community has developed Fountain to make script writing, and its unique formatting, accessible via any text editor. I am not a script writer so if you are interested in this feature, be sure to check out the Fountain web site; however, if I ever do decide to write the next great Sci-Fi movie or TV show (I do have a few ideas), I now have the tools to produce the script on my iPad! No other editor I tested has this feature. New Icon - I know this seems petty, but the app icon really seems like an image found from a 1990s web page. I can’t help but think that potential buyers see this run away searching for something that is a bit more polished. First impressions really count. Online Documentation - The Writing Kit web site provides some information about the app and there is limited built in documentation, but there needs to be more. Up/down cursor movement - Left and right cursor movement is appreciated, but filling out this feature with up and down would be useful. this could be gesture based or via the enhanced keyboard. Line, sentence and paragraph selection - Selecting a word in iOS is a simple double-tap affair. Writing Kit even provides a few extra gestures to make selecting multiple words a bit easier. Selecting a line, sentence or paragraph is still painful though. The addition of these selection tools, in any form, will further enhance my workflow. I could have used these tools several times myself during the creation of this blog post. Dropbox most recent listing - Writing Kit does a great job of integrating Dropbox support except for this one key feature. You can view the documents within a Dropbox folder, but only alphabetically. Elements, and some other apps reviewed, provide a last date modified list. I live by this option as it allows my most current and important docs to rise to the top. Preview last edit - This would be a stolen feature from Brett Terpsta’s wonderful Marked app for OS X, but is seriously needed. Hitting the preview icon currently displays the rendered view of your Markdown, but always begins at the top of the document. Often I have a bit of code I need to review frequently, tables for example, and I have to start at the top and scroll down each time. This becomes a bit tedious for long documents. Automatic text completion - iOS includes rudimentary text completion that is haphazard at best. BBEdit on OS X and other popular coding editors include a more robust text completion algorithm. Hitting the ESC key after typing a few letters of a word will reveal all the words within the document that contain those first few letters. You can then select from the list. Coders use this feature primarily to ensure they don’t mistype a variable, but writers can use this to expedite the typing of common words. Extension API - I admit it, I’m a bit of a customization junkie when it comes to apps and love all apps that provide hooks to allow new features to be added. Textastic supports this feature so why not throw this one in for good measure. Writing Kit 3.5 currently has a 3.5 star rating on the App Store and I for the life of me don’t know why. It is a capable editor that should be on every Markdown, text editor or Fountain users iPad. I find it to be an indispensable tool and look forward to future releases (I’ve been reading that version 3.6 in currently being reviewed in the App Store). It is well worth $4.99. If you decide to give it shot or a current a user. Drop a comment below and let me know what you think about the app.